Amy was born in Charlotte, North Carolina, and grew up in Spartanburg, South Carolina. "I am the only musician in my family," she says. "I remember the day my mother asked me if I wanted to play piano and I said 'Sure, why not?' I was nine. From that time, Mom and Dad supported my decision to study music, though they didn't know that much about it." Amy and ISO Principal Tuba Tony Kniffen were married on August 12, 2000, and have three children. Their twins Jason Whitford and Evelyn Rose were born in 2006 at 29 weeks and are now healthy and enjoying their new little sister, Kathryn Elizabeth, who was born May 13, 2010. Amy plays two different violas in the ISO: one made in 1997 by Hiroshi Iizuka and another that was "formerly owned and loved" by ISO violinist Victoria Kintner Griswold's father. The viola was built in 1945 by an Englishman named Aubrey Tarr and bought in 1965 by Mr. Kintner from the dealer William Moennig in Philadelphia for $500. Mr. Kintner played it as an avid amateur for 45 years, and even met the maker while on a tour of England. Upon turning 90, Mr. Kintner decided to sell his viola since he couldn't play it anymore, and he wanted it to go to someone who would play it and care for it. "I bought it because it sounds great and is easy to play," Amy says. "And because I need an instrument good enough to play in the orchestra in case mine gets out of commission for some reason." 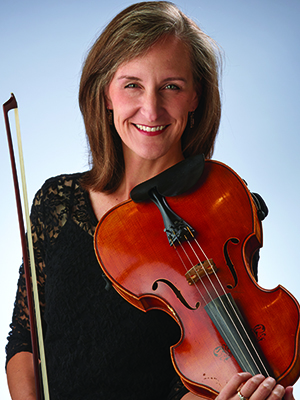 In April 2010, Amy and Vicki performed a short recital at Mr. Kintner's retirement home in Hendersonville, North Carolina, in which Amy played his former viola. "Mr. Kintner told me that the viola maker was trained as a shipbuilder," Amy says. "When he decided to get married, he sold a violin he had made because he needed money. After the wedding he wanted to play again, but alas, no money. So he went to the library, got a book on violinmaking and started making instruments. I think he got remarkably good results from his reading!"